*Game recaps will be posted later this weekend. I can't vouch for SMEAST, but when you are constantly in the running for Sunflower League Champs or Co-Champs, I think that qualifies you as an upper tier league. Just saying. Good observation. That is the funny thing about playoffs, usually only one team is happy in the end. Everyone else ends their season on a loss. That doesn't mean that that particular team is not a top tier team. I'll second the statement about SME being classy. On the field, at least the defense, was pretty disciplined in keeping their statements to themselves. I heard very little talk from them all game. SM WEST was without their top 2 players on offense, Tre Burt, and Will Livingston. We saw what happened when Armani Williams has to make plays without them, fumbles and costly interceptions. It'd be interesting to see what West kind of run West could have made with those two players in the lineup. Keep dreaming. Not a chance. 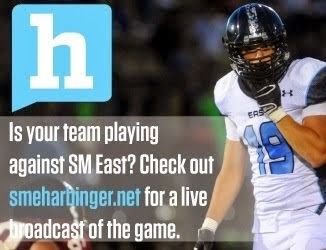 SME lost the game Friday for one reason: OS has depth at the lineman position. South did not have a lineman playing both ways while east had several. This definetly was a factor. I have seen what ON has done to OS the last few years and it is ugly. North is a playoff team. OS is a dreamer. This one will be over by half. Can you say speeeeed and ON has way too much for the Falcons. As for SMW. They should quit after the regular season. Look at their past playoff record can't win a playoff game if they had to. Callahan a good guy as coach but is the Marty Schottenheimer of the Sunflower league, OE Meyers close behind, OE will choke in the second round. Who cares about platooning that is over rated at the high school level. Victor Simmons and Adonis Saunders will smoke OS from both sides of the ball. OS and their wannabe spread offense will be dismantled by half time. People don't realize that the first 9 games are preseason for the Eagles. The season just started for this football machine. OS is just a speed bump on the way to Topeka. I am an OS alum and I have to admit we will have r hands full. Last season we played smeer the queer in the mud at practice before the ON game and payed for it on the field against them as they destroyed us. Hopefully the OS coach staff will take it more serious this year. Could be the best team since Littrells days. Good falcons!! As for SME watch out in future years Sherman knows how to won and it is contagious amongst Lancers. SMW quit whining about missing players. In order to make a run in the playoffs you have to have players who can endure 9 weeks of football and have a coach who can have his team peaking at the right time. West can do neither and haven't since the 1980's. The falcons will blow ON out. ON doesn't have the same talent as in years past. Watch out for the south aerial show it can't be stopped. These Falcon fans must be sniffing on paint cans. Watch after the game and see how many of them will get od'd. 3 players kicked off and looking for a new coach...what are you smoking? Sure looked like everyone was there (injured RBs on the sideline). They would also be crazy to fire a coach that consistantly puts up 7+ wins in the Sunflower League. I guess he could choose to go somewhere with more support instead of criticism after a solid season with average talent. If you were at that SMNW game you would know that the West dominated SMNW but a huge Special Teams play and a not shutting them down after a turnover led to a loss. Credit to SMNW for holding the Vikings out of the endzone more but if you were there...wow. All that said...thier season is over and SMNW is playing. I'm sure just about all the other teams in the league hope you are right about looking for a new coach, trust that the Vikings play would go DOWN with a coaching change. I'm like O south as much as much as the next Southsider, but seriously Falconfan? Have you seen any games this season? Arieal attack, the Falcons pass the ball about 4 times a game! To think that south is going to bowl over North is ridiculous, I know the falcons are better than that last game, but really, it's going to be a close game, victor and adonis are a lot to handle. I hope OS fans and Players alike (Clayton) don't seriously think this is going to be easy. ^ Ahhh a normal Falcon fan here... I like what you said and I do argee that the Falcons show a lot of improvement after losing to the Eagles this eariler season. But commenting on about the "air game".....hilarious!!! Mark my words, the OS coaches will suprise ON with an aerial attack, they know they can't run on the eagles, this will catch ON off guard and force them into a 3-4 defense that will then open up the run. Falcons aren't worried about Eagles, are looking ahead to Wichita Heights. I already marked your word, Falconlover...as in "idiot"! Promise us, after the Eagles killed the Falcons over a easy game...don't bother come back to post of these pathelic sob stories from you again! Good luck in 2011 season. @Eagle1 1980's? Try 2004 - Made it to the Semi-Finals,05 - Made it to Sectionals,07 - Made it to State remember? Yes West has been suspect in the playoffs the last few years, but I do remember a horrid stretch for Olathe North not to long ago. You are right Eagle1 on some accounts, but not a serious run since 80's. So losing to Hutch 21 -14 in the last minutes of the Championship game (only loss of the season) isn't a serious run? Huh, well I hope you guys win it this year because serious crow would be eaten if not. But since you already were shut out this year I guess it's not a serious run. BTW in the last two games ON vs SMW I think this last one went to ON 29-22? and the one before that SMW put 40 some odd on ON in a blowout. But I'm sure you were fantastic that year. ON is a great team, without a doubt, but I'm sure you didn't play there due to your need to put down other teams instead of being proud and confident of your own accomplishments...hater? Go win it all (if not it wasn't a serious run and you aren't any good with horrible coaching and no talent), no excuses or you are a whiner. I doubt many coaches would post on here but I'd love to hear a poll of true coaches that actually think (not just smack talking) West would improve without Coach Callaghan. yahn!!! to the previous post. You do have one thing right, if you ain't winning it all, you ain't makin a run. SMW, give me a break, beat SMNW 37-13 during regular season, lose when it counts. I never said SMW would do better without Callahan, in fact they are as good as they can ever be with a coach like Callahan, contender during the regular season and pretender in the post season. Why don't you start focusing on girls basketball, football is over for the Vikes, put a fork in it. @Eagles1 - I like how you say your an ONorth fan and then say as WE take the field. Such irony. And by the way SM West had not lost to Olathe North since 2004. I guess it wasn't a horrid stretch but in 05' and 06' ONorth was 6-4, 4-5, respectively. The worst record West has had since 2003 is 5-4. Just quit being a hater, ya Olathe North is good, but they are not the end all be all of Sunflower Conference football.